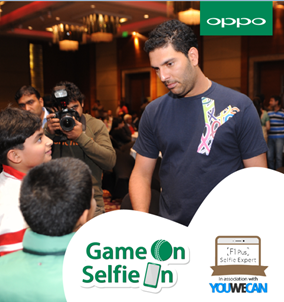 OPPO, the leading global technology brand, which recently brought Selfie Expert OPPO F1 Plus that has created a buzz in the market, has now partnered with ‘YouWeCan’ Foundation, an initiative by Yuvraj Singh, to launch a charity campaign called – “Game On, Selfie On”, to raise awareness about cancer and facilitate cancer screening. The campaign by OPPO aims to bring hope and light to society by helping the foundation in facilitating cancer screenings for maximum people. By associating with ‘YouWeCan’, OPPO wants to expand horizons and spread the message of hope via an influential platform. It will be launched with a series of social media posts on facts about cancer in order to create sustainable conversations amongst audiences and especially amongst millennials. The more these posts are shared by users on their personal networks, more will be the level of awareness. OPPO will donate Rs.10 for every single ‘Share’ of the post to ‘YouWeCan’ Foundation. Upon hitting 50,000 ‘Shares’, OPPO will donate Rs. 5 Lakh and on exceeding 50,000, OPPO will double the donation amount to Rs. 10 Lakh. There’s also a surprise for the fans. Every week lucky fans stand a chance to win one OPPO F1 Plus and one OPPO F1. The initiative is open to all residents of India aged 13 years or above. There is no entry fee or purchase necessary to join the campaign. Every participant must access the campaign through their own social media assets. The campaign will launch on social media on Saturday, 30th April 2016, at 9:00AM which is when the first post goes live. All shares on the post from 9 AM on Saturday to 11:50 PM on corresponding Sunday will be taken into consideration for the donation. The dates for the campaign post are 30th April to 1st May, 6th May to 7th May, 12th May to 13th May, 20th May to 21st May. “YouWeCan is a very good initiative and we are proud to be associating with it. As a brand, we would like to give back to the society in a way that helps millions. And with this campaign we would like to reach out to people, educate them, spread awareness and bring hope.” said Mr. Sky Li, OPPO VP, Managing Director of International Mobile Business and President of OPPO India. “I think it is a great step taken by OPPO in launching such an initiative and the fact that they are not only donating to the ‘YouWeCan’ Foundation, but are also committing themselves in being actively involved in spreading awareness. I would encourage everyone and especially my fans to participate in this initiative.” said ace cricketer and OPPO’s first sports ambassador for this cricket season, Yuvraj Singh.